It’s getting warmer now but I still wear a sweatshirt while working in the garden. The temperature was a little bit above 50° F but the bees were all over the birdbaths, especially the heated one. I put a couple of stones in each birdbath for the bees to use as a landing and for small birds to enjoy taking a bath in a shallow area. The bees seem to come for the water in the last few days. I’m not sure if they need water to soften sugar syrup they have taken in earlier which might have turned crystalized when the temperature dropped to below freezing in the last few nights. Or, they need to feed new lavae which, in this case, is a good sign. 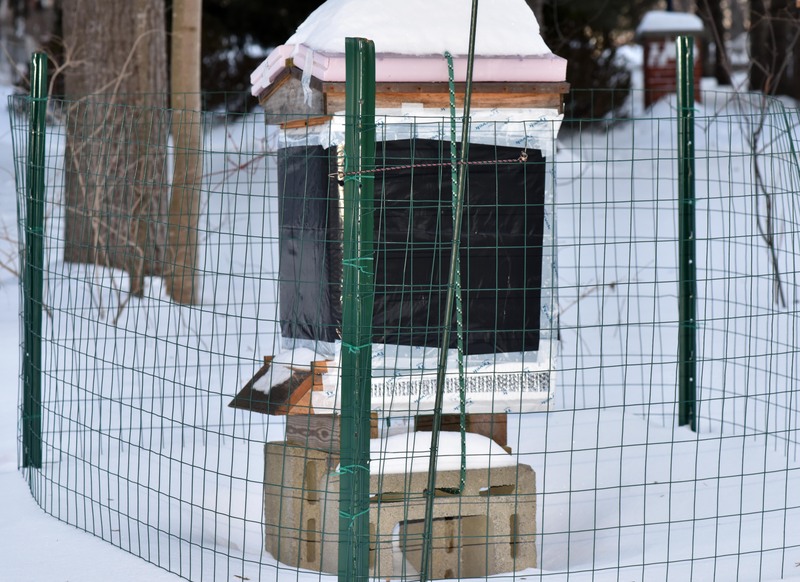 I don’t think cooling the hive is the reason at this time of year when the temperature is still below 60° F most days. Some of them prefer to get a drink from tiny droplets on grass. Whether they drink from birdbaths, blade of grass, the end of the hose, it’s fun to watch. The bees also serve as a reminder for me to clean birdbaths often. I know they can drink from any sources as long as it’s not toxic but seeing them drinking from a dirty source and taking it back to the hive just gives me a yucky feeling. According to the calendar last Wednesday was still winter, but the weather was more like summer. The temperature had gone up above 80° F. I had a day off from work and because it was so nice outside I spent most of my day in the garden. I achieved my main priority: removing the winter insulation and inspecting our beehives. I finished the first two large hives but debated on opening the smallest one. I wasn’t sure if the temperature will drop down below freezing again or not. 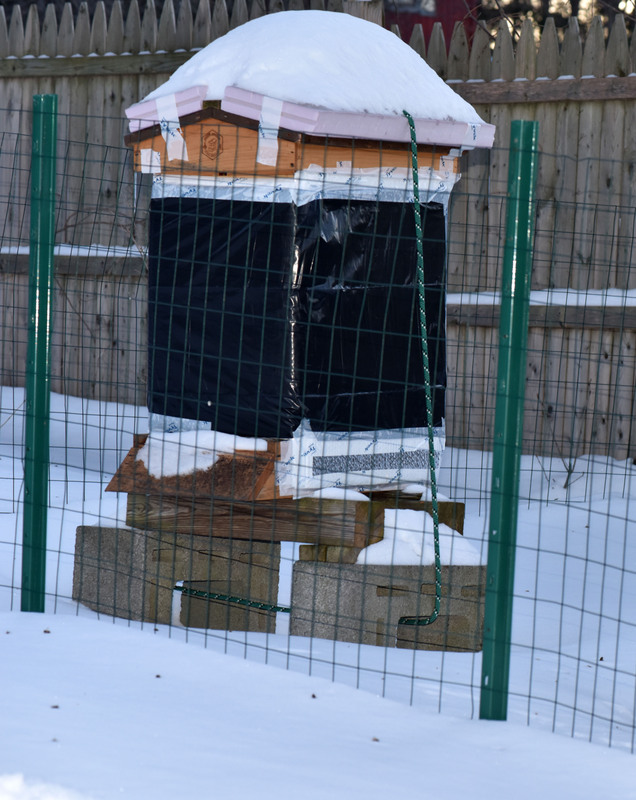 My concern was that the little hive, which looks more like a nuc than a full hive, will not have enough bees to keep themselves warm if the temperature drops. But after observing them for a while, watching them fan the air into the hive to cool it, I removed their insulation as well. I was happy to see that they all survived and still had plenty of stored honey, especially the main hive, #1. Hive #1 still had a super full of honey. It’s still early March and not much is blooming yet, so I left it for them. They had been bringing in pollen, nectar and sugar syrup that I put out for them throughout the day. There was a pollen rush at certain point. Nothing much is blooming at this time except the Silver Maples (Acer saccharum) in the yard helping to supply them with plenty of pollen and nectar. I’ll put sugar syrup out for them until the Dandelions bloom. Hive #2 also has a lot of food remaining in storage but a lot of combs are attached so I only removed a pair of them and let the rest stay attached. I will replace them after the bees have drawn all the honey from them. This hive exhibited another strange behavior, they chewed off wax at the bottom of each frame in the bottom super. Since the bottom super is usually empty at the end of winter, I replaced them with new frames instead of switching the supers. The #3 hive that has the fewest bees, pulled through the winter well. This is the hive that had closed off the top entrance and left just a pin hole for the warm air to come out. The survivors are grouping in the middle of the hive straight up in both supers. 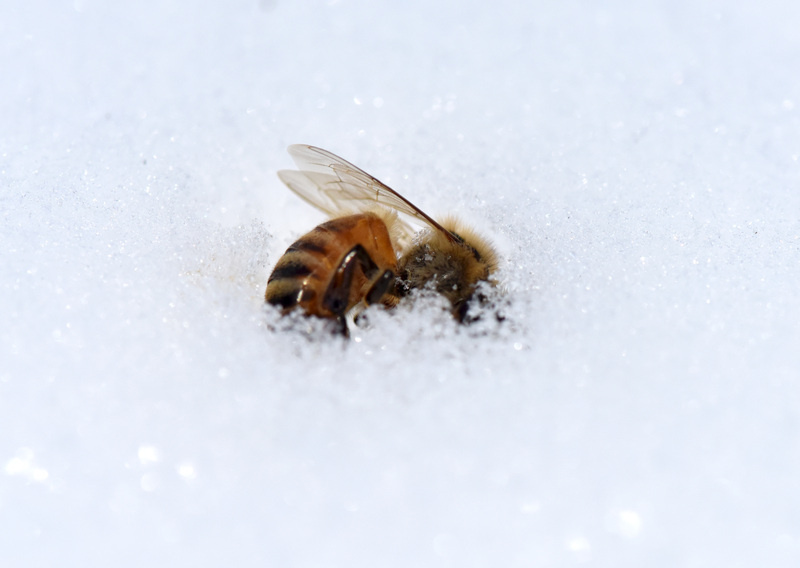 I expect in order to keep warm with a small number of bees, staying in the middle of the hive helps. They are busy taking in sugar syrup and pollen now. Hopefully, the queen will do her duty and produce a bigger brood this coming season (otherwise she’ll be dethroned). I’m happy to find that they look healthy, disease free, so little mites and no wax moths. However they glued everything tightly with propolis and I had a hard time inspecting. There will be a lot of scraping when I have to change supers. But clean bees are happy and healthy bees. There are still a few feet of snow in the garden and the temperature remains below the freezing point. There’s no sign of spring in sight aside from a few confused American Goldfinches that have started to molt early. We chiseled a path around the house but not much else. House bound, pretty much. Reading books and plant catalogs keep me busy in winter. 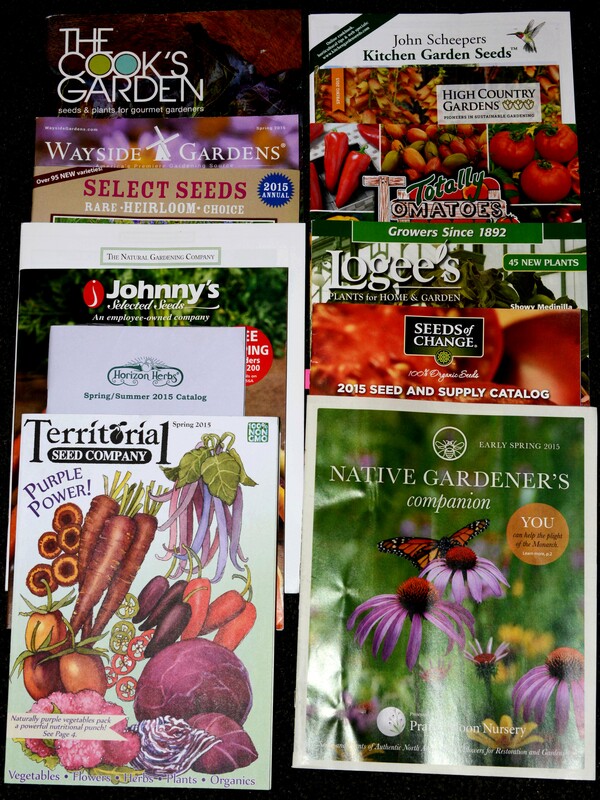 With plant and seed catalogs coming in non-stop, they have been keeping me going like a kid in a candy store. With limited space, I will only add one or two new plants a year. Since I started keeping honeybees four years ago, the first reason for selecting a new plant is whether it’s good for the bees and fragrance comes in second. 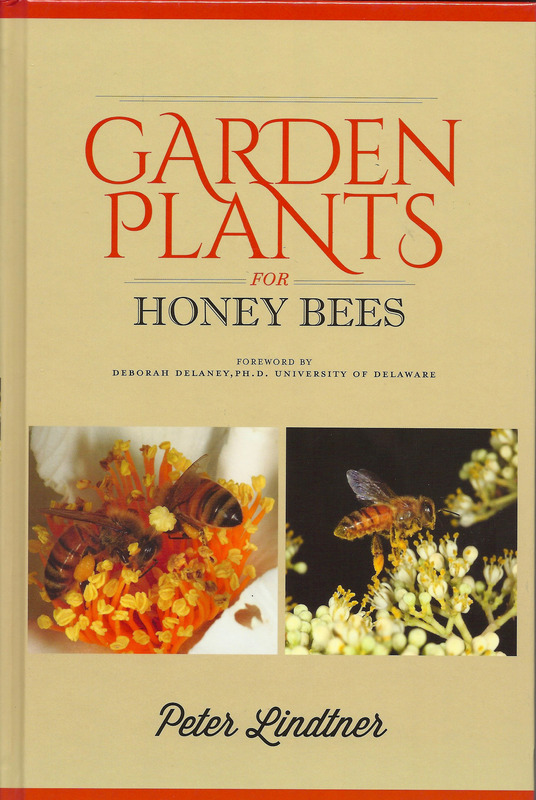 This winter I found an interesting book while searching for plants for bees; Garden Plants for Honey Bees by Peter Lindtner. The great thing about this book is that it provides a variety of plants that bloom month by month, starting from February. The book also provides information on the level of pollen and nectar each plant provides, from (*) as the least and (*****) as the most. So, I keep going back and forth between plant catalogs and this book to make a decision for what to add this spring. 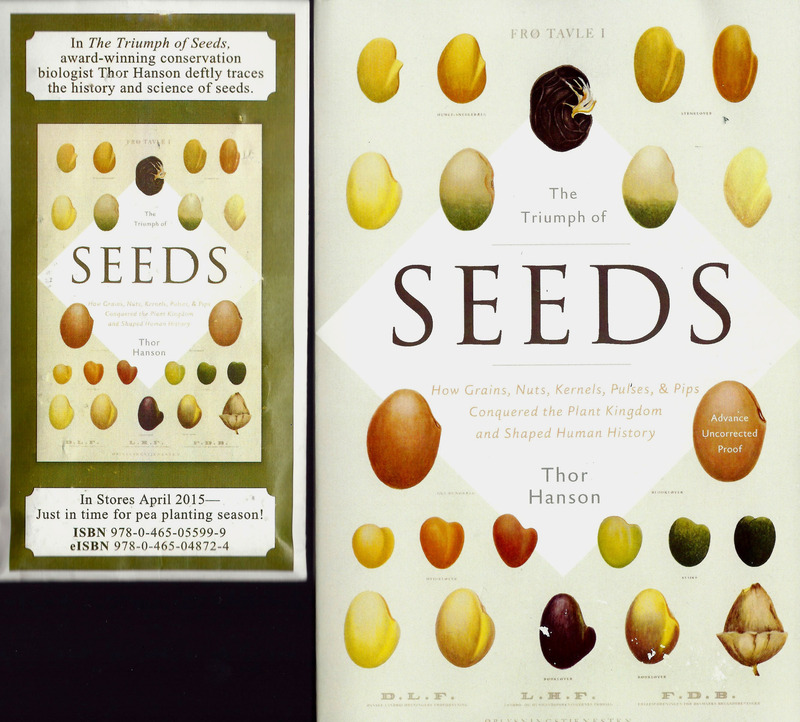 My friend, Andy, has given me an advance copy of The Triumph of Seeds: How Grains, Nuts, Kernels, Pulses, & Pips Conquered the Plant Kingdom and Shaped Human History by Thor Hanson. It comes with a package of pea seeds. I’m not sure I will plant them since there is no indication that the seeds are organic. The book is a fun read though. I’ve learned a lot about chili pepper. I’ve been growing a wide variety of chili peppers for years and just realized how little I know about their biology and evolution until I read this book. I also learned that the coffee plant has developed a delicate caffeine balance to repel various types of insects and at the same time lures in pollinators that ‘lined up like morning commuters at their favorite espresso stand’. It gave me the idea to try using coffee as a natural insecticide in my garden. The book won’t be in stores until April though. Yes, late winter is the time for me to start seedlings. Side stepped to the subject of books and lost track while I writing this post. I will have to start my tomato and chili pepper seedlings this week otherwise they will not have enough time to mature and bear fruit. I will add Japanese Shishito, a very mild pepper and Indigo Cherry Drops tomato to the vegetable list. A variety of Helleborus will be added to the flower list for early spring flowering for bees. I can hardly wait to get my hands dirty.